While our traveling adventures aren’t quite as frequent since adding Little Miss to the mix, we have been on many a trip together in the last 9 years and have learned a lot about how to travel more simply while still being completely comfortable. I started doing this after Little Miss was born because I felt like I couldn’t just toss everything into a bag without forgetting something important. It also helps to not have to recreate a packing list every single time we take a trip, but to just reference the one I already have created. Try to make a list of all the things you use throughout the course of an average day – like contact solution, underwear, a comb, etc. 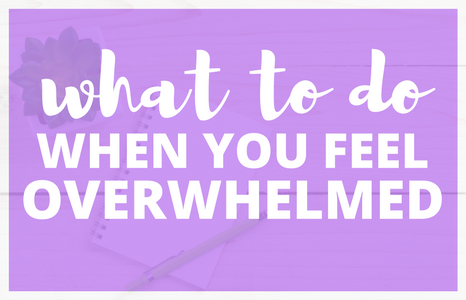 Write down all the things you use during your typical morning and nighttime routines as you go through them, and it will help ensure that you aren’t forgetting anything important that you might need. 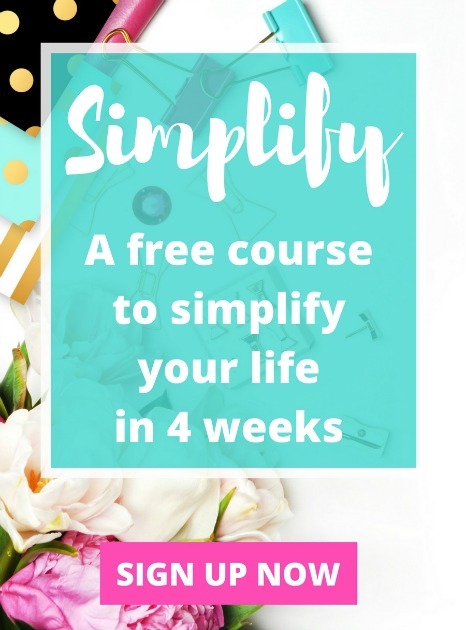 Planning ahead for exactly what you should be wearing to be comfortable is going to drastically cut down on the amount of clothing you’ll need to bring. Of course you should plan for the weather being a bit different than what the forecast predicts, but it will give you a general sense of how many pairs of pants vs. shorts to bring and will hopefully allow you to cut down on the amount of each of these. When traveling, I usually try to stick to one pair each of gym shoes, dress shoes, and flip flops. If you need to get more dressed up during your trip, choose a more neutral or black dress shoe so that it will go with any outfit you’d like to pair it with. This way, you aren’t bringing multiples of something when just one will do. Putting items like underwear or socks into your shoes can not only save space in your suitcase by utilizing the area inside of your shoes, but it can prevent your shoes from crushing too. If they provide things like a hair dryer or shampoo and conditioner, those are a few less things you have to pack and then remember to bring home. Take advantage of this! I usually never travel with a hair dryer because most hotels do provide them for guests. 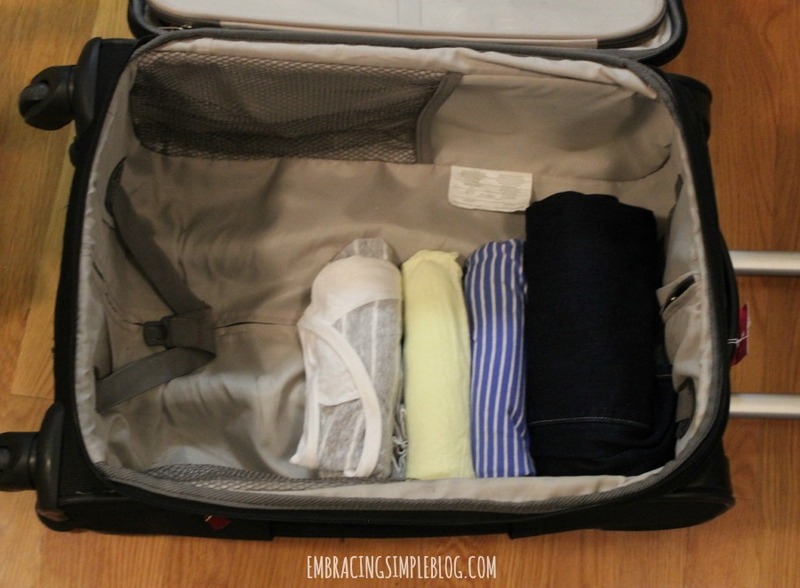 I find that my clothes take up significantly less space when I fold them, which is always a nice option if you are wanting to travel light but need a bit more room in your suitcase. The only caveat to this is that I find my clothes are a little more wrinkly when I roll instead of fold. I find it worth it if it means bringing less suitcases with us or not having to pay a luggage fee though, so you just have to determine what works best for you. This is something I never did until we started traveling with Little Miss, but it is really nice if you have a laundry room available to you at your hotel. 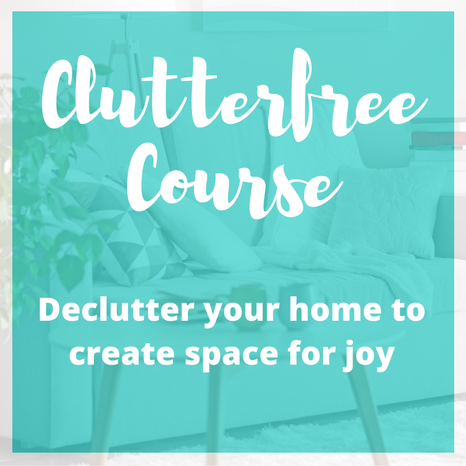 Not only does it cut down on the amount of overall clothing you need to bring, but you might even be able to come home with very little dirty laundry this way. I washed most of our clothes at the hotel before we came back from our road trip in early September, and it was such a treat to just have to unpack them when we got home instead of doing mounds of laundry all at once. When we are flying, we almost never check bags. As I mentioned above, even on our 9 day honeymoon trip we both each had just a carry-on. And yes, I still had plenty of cute outfits to wear! Not only can this strategy save you fees for checking luggage depending on your airliner, but it will also save you the headache of your luggage potentially not showing up when you arrive to your destination. I will say, this becomes a bit more difficult if you have a baby with you. At the toddler stage Little Miss is in, it is doable to travel this way, but definitely wasn’t when we took a trip when she was 6 months old and I needed to pack significantly more items for her. The bonus of carry-on luggage is that you can put your kids to work and make them haul it across the airport 😉 . Little Miss is apparently more than happy to help Mama out with this task! While this is necessary to get through security if you only have a carry-on bag, it’s also nice just in general to be traveling with less. We have reusable travel-sized containers that we put our shampoos and lotions, etc. into for every trip and it’s nice even for road trips to only take what you need. A huge bottle of shampoo can really weigh down your suitcase and cramp your style! Clothing made from polyester blends, wool blends, microfibers, silk, and rayon tend to do much better with traveling than linen or 100% cotton. This isn’t something I always practice, especially since Little Miss wears pretty much only cotton clothing and most of mine is too, but it’s definitely nice to do if you can try. 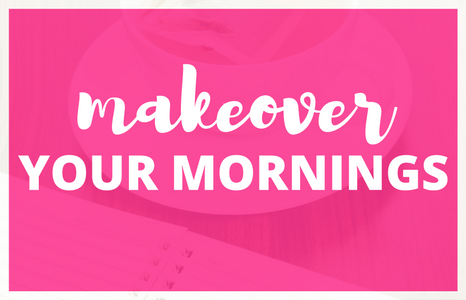 You’ll avoid a lot of wrinkles this way! If you decide to check your luggage and not bring everything in a carry-on bag, make sure to have at least all of your important documents like your passport and other identification, any medications you need, essential toiletries, and one change of clothes. It’s nice to have these things on hand in case your luggage gets lost. This way you can get by for a day or two at your final destination without too much inconvenience. 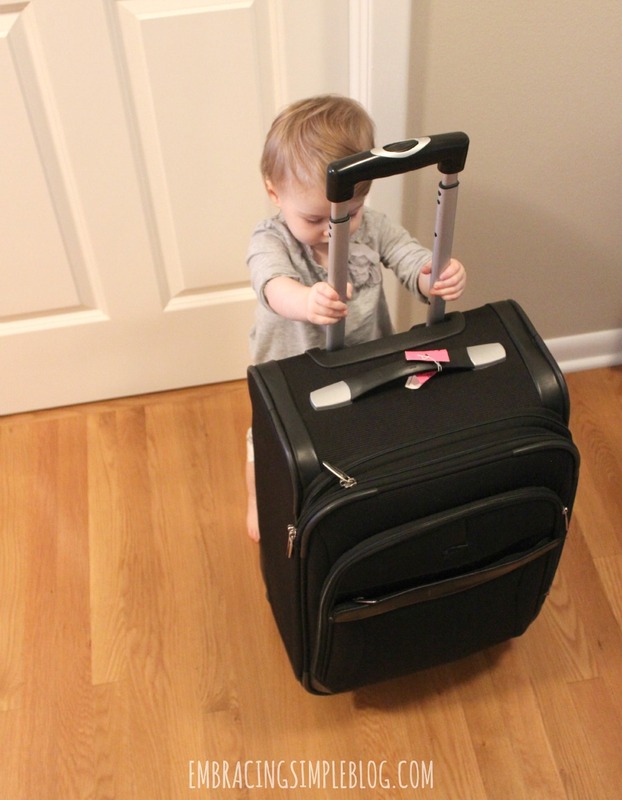 My hubby travels quite often for work, and I can’t tell you how many suitcases we’ve gone through until we finally invested in more quality luggage that stands the test of time. If you don’t currently have quality luggage for your travels, Atlantic® Luggage can be a great resource for versatile, lightweight, and affordable luggage. Amazon is actually currently running a Special offer on Atlantic Luggage 21” Spinner so it’s the perfect opportunity to invest in a quality carry-on bag to simplify your packing process if you don’t have one already! Now it’s your turn to travel! 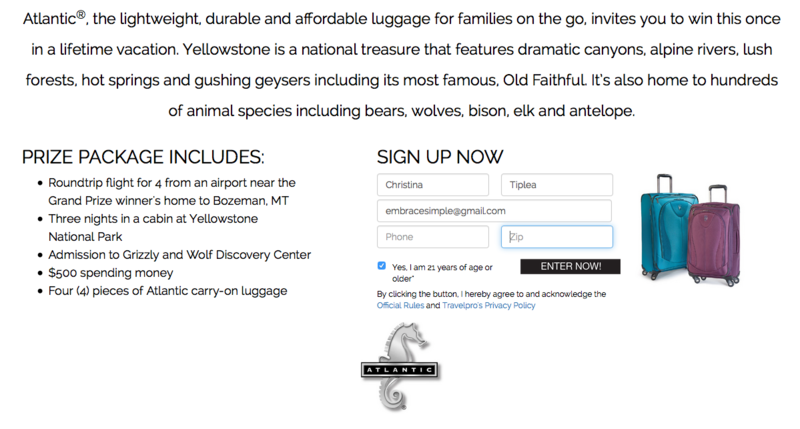 Atlantic Luggage is running an amazing sweepstakes where you have the opportunity to Win a Yellowstone National Park Adventure. This trip sounds like the trip of a lifetime to me! If you win, you will get to experience the beauty of Yellowstone National Park with your spouse and kiddos! It would be an adventurous family vacation filled with biking, hiking, fly fishing, kayaking or other countless activities that are available. Be sure to register today for your chance to win an adventurous trip for your whole family! Winner will be chosen within 30 days following the close of the sweepstakes. 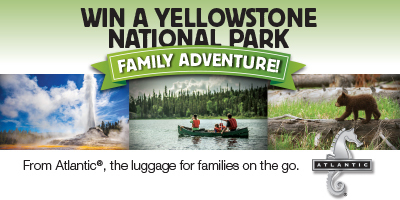 Win a family trip for four to Yellowstone National Park, courtesy of Atlantic Luggage! Do you have any trips planned in the near future? 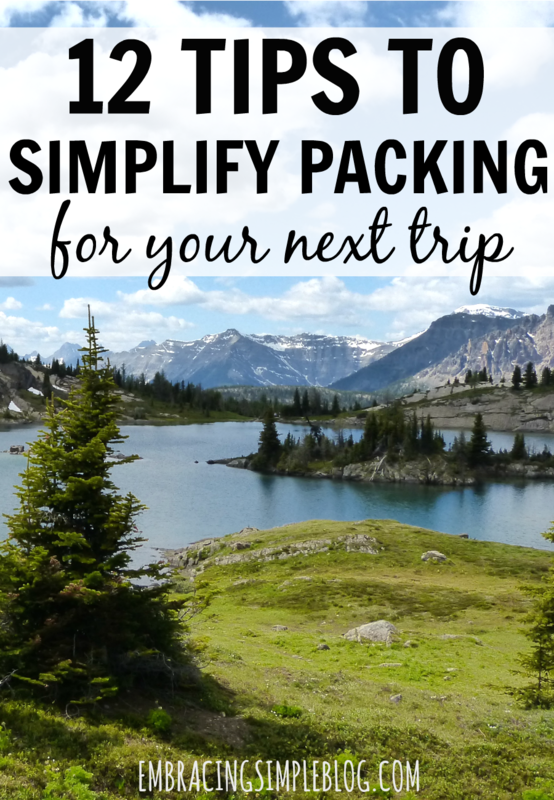 What tips do you like to use to simplify packing for trips? Great tips!!! I used to be such an over-packer but now I pack extremely lightly to make room for all the girls’ stuff, haha. Great tip on rolling your clothes! I’ve heard that before but have never tried it myself. 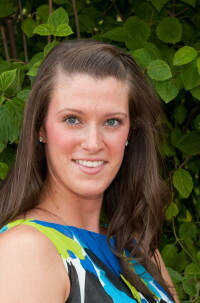 Hope you have a great day, Christina!! Haha! I actually keep my master list in Evernote, otherwise I would totally lose it between every single trip! Great tips!! I just had a baby, and will be taking him to Hawaii in November. It wi definitely be different packing for a little one. LOVE tip #1. I will have to start doing that! 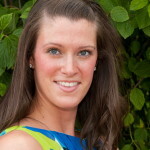 Aw congrats on your new baby Chelsea, that is so wonderful! You made need more “stuff” to bring along when they are only a couple of months old, but I think you’ll find it to hopefully be a pretty enjoyable experience overall. Once they start walking, they tend to put up a bigger stink about being trapped in a car seat/place. Best of luck to you with your upcoming travels, I’m sure you’ll be enjoying beautiful Hawaii with your little family!! Packing everything into a carry on if you can is huge for me when I’m flying with just a kid or two. My toddler and I are flying for a weekend trip to my folks house next week. I’m sooo packing the little stuff in ziplock bags this time. Thanks for the idea! We packed in carry on luggage for a 2-week trip to London. I discovered the local laundromat is a good place to meet the locals and get tips from them as to where to eat and what to do. When we took a trip where we were at different destinations many nights I made shirt packs. Each large zip-top bag held a clean shirt, underwear, and accessories. Each night I could hang up the shirt so wrinkles would fall out. Next morning it was easy to find my accessories and I then had a bag for the dirty clothes. We were traveling with a group that trip and we were always the first ones ready to leave in the morning. That’s fantastic Linda, I felt the same way when I did a month-long study abroad in Rome during college and used the laundromat every week. It was a pretty fun experience actually! Shirt packs sounds like such a genius idea, thank you for sharing!! I will have to give that a try on our next trip, that would be an awesome solution for both myself and Little Miss to get us out the door quickly in the morning! I used to travel for the military once a month, so I have a whole second set of hygiene items, so I never have to pack a toothbrush, brush, deodorant etc. Same with the phone charger. It makes it so easy! I also buy the refillable travel shampoo bottles and just fill them with my shampoo at home. It’s cheaper and I get to stick with the brands I like. That’s a great idea Heather, I especially love having a second phone charger. That would be one thing I definitely wouldn’t want to forget! This post came at the perfect time. We’re going on our first road trip with Allison to Michigan soon and then flying with her in Jan. I will read this post again before we go. That’s so exciting Sara! You guys will have a wonderful time 🙂 Where are you going in January? Too fun! Haha that’s why I love ya Kay! I’m not a stylish gal either. I usually just go for my signature black flats anytime I need to be a bit dressier, and they go with everything (or so I like to think anyway!). 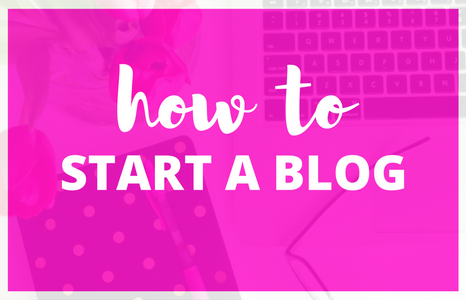 Very helpful post! You gave me great advises about what and how to pack for my holiday. Thanks a lot!! That’s quite an interesting article Christina, and I find it really useful, As a corporate traveller, packing things is literally hectic work, and I am going to follow your tips for my upcoming travels. Hope this parking trick could save some space.